(Fall 2005) — Sheehan World publisher Kathy Sheehan has survived a bear attack on a birthday cruise to Alaska, according to Virgo authorities in Bellingham, Wash.
Sheehan, celebrating her 29th birthday again this year, was mauled by a grizzly bear while sightseeing in Glacier Bay aboard the Volendam with 10 family members and friends. "I was watching these magnificent 250-foot pinnacles of ice calf into the water when the bear came charging out of the casino," Sheehan said. "He first attacked my brother, Billy, biting off his arm. Then he came for me. Luckily, my cabin boy, who does a mean impression of a fierce walrus, came to my aid." Sheehan also gave credit to her sister-in-law Linda Dingee, R.N., another family member on the cruise, who administered First-Aid with a bottle of tequila. The bear later attempted to crash a SCRABBLE game on the Lido deck of the ship but was scared off by Dr. Ruth Harvey of Philadelphia who claims to carry the "smartest knife in the drawer." 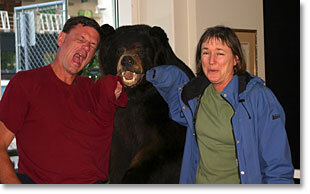 Sheehan had organized a group of friends and family for the Alaskan birthday cruise from Vancouver, B.C., but denied she had invited the grizzly. "It wasn't even his birthday, so I don't know what the deuce he was doing on the ship," she said. 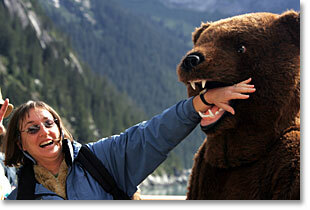 The bear attack was a minor incident in an otherwise calm voyage to set off a series of Kathy birthday events. In addition to the above-named people, cruisers who witnessed the birthday bear attack were two Donnas (Sheehan and Connor); two 14-year-old boys (Brian Sheehan and Bennett Kerr); two Virgo brothers (Chuck and Bill Dingee); and Jim Martin, whose birthday celebration a couple of days later marked his eligibility for a certain kind of medical insurance.